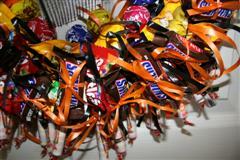 Candy Wreath ~fun and easy to make. 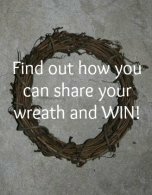 If you can tie your shoes you can make a wreath, with these simple to follow instructions. Thinking of you wreath to send to your college student, to let them know you are thinking of them during finals week. 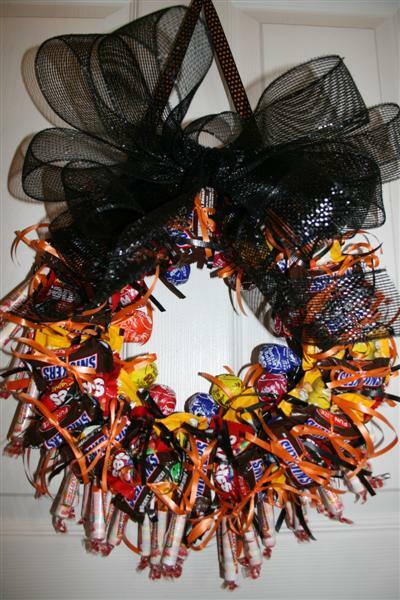 I chose to make my candy wreath to send to my son at college for Halloween. I also made one for my nephew who is also celebrating his 21st birthday close to Halloween! They can hang them in their apartments they are decorated for Halloween and can share with friends when they come over. Easy Decoration for young guys who probably did not think about or care about decorating. 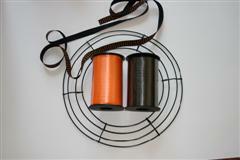 Cut 5/8” wide ribbon 28-30 inches long to make hanger. 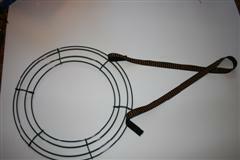 Fold in half and tie knot to make a loop for hanging. Fasten the ends to the wire form by hot gluing and then I also stapled for additional support. Next I wove remainder of ribbon around the frame and glued ends together. I did this so as the candy is removed the wreath does not look so bare. 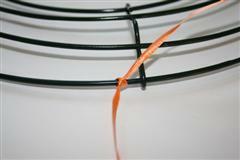 Cut the orange and black curling ribbon to about 15’long (depending on the size of your candy). You will need one for each piece of candy, so cut a lot! Tie on the candy! You can start anywhere depending on the candy that you have, I started at the bottom and worked my way half way up the sides with Smarties. Next I layered the candy starting with large lolly pops on the bottom so other larger on top would help hold them down, then alternated additional candy on top. 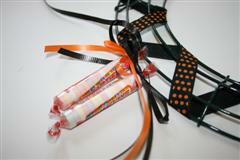 You will want to tie so that the candy can be removed by just untying the ribbon. I tied the string to the frame then tied the candy onto that. For candy like the smarties where you are tying around a small area; I first tied to the wire frame then tied the bow on top of the candy, so when the string is pulled candy is released. 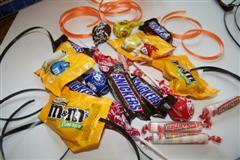 On the larger candy I tied the ribbon to the frame then tied like tying a shoe around them for more support. 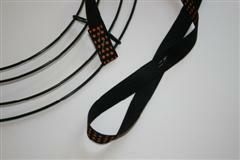 Hold the wreath up by the hanger occasionally while tying on the candy to make sure it is hanging the way you want it and secure. 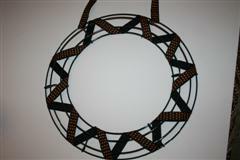 Add a bow to the top and you are finished. 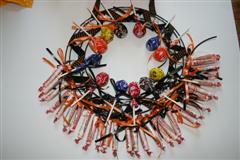 Have fun and be as creative as you want with this candy wreath. You can easily change the color scheme with a different ribbon and bow you can make this a birthday, graduation, or congratulation wreath.